More friends and a blog: (Almost) Done! Not the greatest photo, now that I look at it. However, it will have to do since taking the time to get another picture will cut into my sewing time and I would like to work on my almost finished ottoman throws. I'm pretty proud of my sweater. It's flaws are subtle enough that when people see it, they will look at me with an impressed look on their face rather then a pitying one (you know the one where they pat your head and grimace slightly while looking at your finished project - or does that just happen to me?!) 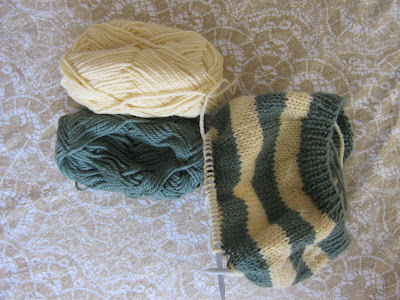 All it needs to be completely done is a good blocking, as the bottom seems to like to roll up. As you can see, (the awesome) John Robbins is giving me a hand for the picture but I obviously can't wear it like that. The hood also needs a casing for a drawstring, even though I don't want the drawstring. I will set myself a completion date of... um... February 10th. 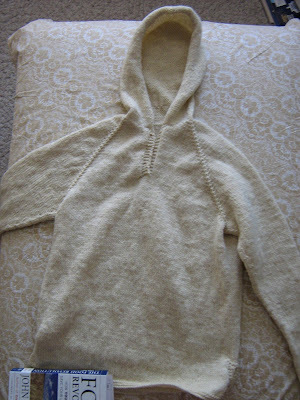 Before February 10th, 2008(ish), I will (probably) post a photo of the sweater all ready to be worn. A kicky, little beret! I have been teasing my husband that it's for him and that my feelings will be greatly hurt if he doesn't wear it. However, he said to me this morning that if he has to wear the above kicky, little beret, then he will start making me clothes too. Do I back off or do I say 'Let the games begin!'? Make him wear a "kicky" little beret and he might just "kick" you out! Although maybe you could get him to model it for a photo for the blog. Well, R, are you brave enough for that? Wow you've come a long way baby from those slippers you started making! I think the whole family should wear those kicky little berets, mother father and son but not the grandma! Oh Samantha! I WANT one of those! WOW! I LOVE the sweater and would consider the rolled-hem a fashion statement all its own. Do you know I have NEVER BLOCKED anything? And have no idea how? No wonder nobody begs ME to make them anything! Can't wait to see the beret! Is it cotton? FUN! Mary-Sue, the rolled-hem could be a fashion statement but it hides the lovely bottom detail and turns it into more of a belly sweater then a warming sweater!! I have never blocked before either so it should be interesting! that sweater looks like a pull on comfy sweater. Once you'll keep reaching for. The beret is cute too!